Through the Localism Act, which became an Act of Parliament on 15th November 2011, the government is giving local communities more power to influence the future of the places they live by preparing neighbourhood plans. Neighbourhood plans can establish a vision for an area as well as general planning policies for the development and use of land in a neighbourhood. They should be about local rather than strategic issues. For example they could cover where new shops, offices or homes should go and what green spaces should be protected or other planning related issues. Neighbourhood plans should be focused on guiding development rather than stopping it. They also have to be in line with national policy and the Council’s local planning policies. Once adopted they will become part of the statutory planning framework and be used to guide decisions on planning applications. What is the scope of a neighbourhood plan? Promote more development than is set out in the Wiltshire Core Strategy. Include policies, for example regarding design standards, that take precedence over existing policies in the Local Plan for the neighbourhood – provided the Neighbourhood Plan policies do not conflict with the strategic policies in the Wiltshire Core Strategy. Conflict with the strategic policies in the Core Strategy prepared by Wiltshire Council. Be used to prevent development that is included in the Wiltshire Core Strategy. How does this relate to the Town Plan? The town plan completed last year is a very useful starting point for the neighbourhood plan. Whilst it deals with far more areas than land use and any views expressed it can be given weight when planning decisions are made by Wiltshire Council, there is no statutory requirement to stick to its recommendations. The neighbourhood plan on the other hand is confined to dealing with the use of land within the parish and once adopted will have statutory force. Its preparation is therefore a more formal process than was the case for the town plan with the required steps laid down by statute. However what emerges will have statutory power in any planning decision affecting land use. If you have concerns about the lack of appropriate housing in Cricklade, whether for families, young single people struggling to get started on the housing ladder or older people seeking to downsize, about the style, size and density of new housing development, about flooding, about traffic through the town, about maintaining open spaces and recreational facilities within the town, about business sustainability and expansion, about maintaining a rural buffer between Cricklade and Swindon, then you should be interested in neighbourhood planning. The Localism Act specifies that, where it exists, a parish council is responsible for the delivery of a Neighbourhood Plan covering all or part its parish. 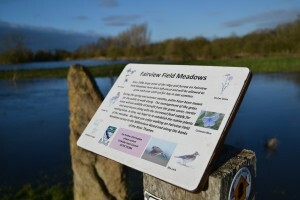 However a Neighbourhood Plan needs to be supported by the whole community before it can be adopted and so the process to deliver it must provide opportunity for all relevant stakeholders to be involved, including local organisations and businesses as well as residents and national agencies such as Natural England and English Heritage. To ensure the process and content is robust all Neighbourhood Plans will be subject to an independent check for compliance with relevant legislation and other planning policies before being put to a local referendum where the plan will need to get majority support before it can come into force. In principle any area can apply to its Local Planning Authority (for Cricklade this is Wiltshire Council) to be designated a Neighbourhood Area and have its own Neighbourhood Plan. Neighbourhood Areas can be for only part of a parish, or cross parish or local authority boundaries, but they cannot overlap with another designated Neighbourhood Area. If the area is very small e.g. one street, the Planning Authority may suggest it joins with other adjacent streets to create a larger area. What is Cricklade's Neighbourhood Area? In early 2011 Wiltshire Council selected the Royal Wootton Bassett & Cricklade Community Area as the location within Wiltshire to try to deliver a single Neighbourhood Plan for an entire Community Area in advance of the Localism Act becoming law. Cricklade Town Council agreed initially to try and work on a Community Area basis, but in September 2012 it decided that the process for delivering a Plan that covered such a large and disparate geographic area was too cumbersome and did not give Cricklade residents sufficient opportunity for involvement, nor sufficient democratic voice in the final referendum and therefore this size of Neighbourhood Area was not in Cricklade’s longer term interests. The application was formally approved on 28th February 2013. What are other parishes and communities doing? The town of Royal Wootton Bassett also decided to request its own independent Neighbourhood Area, but most of the remaining predominately rural parishes within Cricklade’s Community Area are continuing to work together on a North East Wiltshire Villages Neighbourhood Plan. Elsewhere within Wiltshire three other “Frontrunner” areas within Wiltshire (Malmesbury including its two surrounding parishes, part of Warminster and Sherston parish) are developing Neighbourhood Plans along a similar timescale to Cricklade. Nationally there were well over a hundred “Frontrunner” areas, but so far only three have reached the final stages of the process. What is Wiltshire Council’s role? adopt the neighbourhood plan and bring it into force. The Council’s role should be clarified once the regulations have been adopted. A small group reporting to the Town Council is organising two drop in sessions at the Town Hall on Saturday 6 April and Thursday 11 April which will start the process of consultation and we hope everyone interested in the future of the town and its immediate surroundings will take the opportunity to attend. There will be time at these events and immediately following for you to express your views on what your vision is for the future of Cricklade. Following these events there will be opportunity for volunteers representing all parts of the community to join focus groups dedicated to analysing all responses and examining relevant issues in more detail.